Do you need parking for coworking? The Greentown Labs space often looks more packed than even this! One of the great things about working at HB is the chance to set down a laptop in a place like Greentown Labs. The team loves the time we spend there, not just because of the Bevi machine, but because of the energy within its walls. It’s just great to work among so many smart and energetic people and have conversations with them about the future of the world. Todd Van Hoosear and I spent a bit of time working in the MassChallenge offices a few years ago and it was much the same thing. Over at Mullen Lowe‘s Wunderbar, Vishal Chandawarkar, who manages the space, noted that the energy and collaboration between the right people makes it all work. The entrepreneurs developing technology get the right feedback from the UX and digital teams within Mullen, something they couldn’t get if they were paired with, say, media buyers. Still, there are pitfalls, like making sure that everyone signs NDAs and lives by the rules. The conversation that continues online, however, came from Duane Mayo of the International Entrepreneurship Center, who physically hosted the event. He noted that “ample parking” was key to making coworking viable. Some of the discussion on the Village14 blog, which occurred after the talk and involved both those who attended and those who didn’t, centers around transit as key, not jut parking. Of course, you can just listen below and judge for yourself. Feedback welcome! Love or hate Boston, we have bragging rights for a reason and a new win to celebrate — we’re the most energy-efficient big city in the nation thanks to a new report from the American Council for an Energy-Efficient Economy. The report covers various aspects from local government to transportation and community initiatives. You can view Boston’s scorecard here to see the total ranking breakdown. What’s contributed to this major energy win for Boston? Last year, Mayor Walsh released the Greenovate Boston 2014 Climate Action Plan Update, celebrating the city’s progress towards reducing greenhouse gas emissions by 25% by 2020 and 80% by 2050, and to prepare for the impacts of climate change. The nation’s oldest ballpark and home of our beloved Red Sox gained another title this year: the largest organic rooftop garden in the majors. Not only does it provide fresh, organic vegetables, the garden also reduces energy costs by insulating the building below it and will be a ‘teaching tool’ for area children about healthy eating and the local environment. Greater Boston is doing its part too. Somerville Mayor Joseph Curtatone launched a GreenTech program to meet the city’s ambitious goal of carbon neutrality by 2050. As part of this program, Somerville is engaging members of its community to help mold the city’s energy future. Last month Understory, a startup based out of Greentown Labs, joined the GreenTech program, providing the city of Somerville with its solar-powered weather stations as part of a pilot program. Other major cities are now looking at Boston as a model for energy efficiency. Places like New York, San Francisco, Seattle and Denver aren’t that far behind us. How does your city rank? If you’re Oklahoma City, you’re using way too much energy. Here’s an idea to help the environment: you could start cutting back on all the styrofoam cups, Sonic. Blog posts don’t matter… do they? In a recent conversation with the HB team, someone asked if the work we do to keep our blog up to date with relevant content, interesting perspectives and topical news was worth it. You see, it requires a great deal of time and investment to do it well and to do it consistently. And sometimes it’s a struggle to keep up with the pace of the rest of the world’s zeal to produce content. But it is so worth it. As a member of the HB new business team, I talk to a lot of prospects. Among the things that come up in our conversations is how they found HB and what interested them about us. This is also true of prospective employees and new partners. Very often they mention our blog. For example, last week one of the first things a prospect in the energy and sustainability world brought up was Nicolas’ blog about Solar. In another recent meeting, a prospective employee brought up a post I wrote years ago about an unfortunate incident at the OCCC. And there’s the prospect who was about to make a decision on which agency to select, read Chuck’s post about Tom Brady and chose HB. A blog is an opportunity to express a point of view, take your opinions for a stroll, vent or wax poetic about… anything. And yes, it’s worth it. For the first six years we lived in our house, our electric bills averaged $1,500/year. While we wanted to go solar for a variety of reasons, we didn’t think it was likely to be worthwhile financially. So we tried to economize by limiting our use of electricity. That generally didn’t work, as our house came with a pool which runs a filter 24/7 in summer months, a greenhouse with electric heat for winter (it’s freezing in there), and an exhaust fan for summer (it’s boiling in there), and a couple of rooms in the back — the part of the house that used to be a barn — which also have electric heat. The back of the house — the former barn — had a large south-facing roof with asphalt tiles (the front of the house has a slate roof). There’s a huge unfinished area under that roof that turns into a furnace all summer, so we figured it must be getting some good solar exposure. 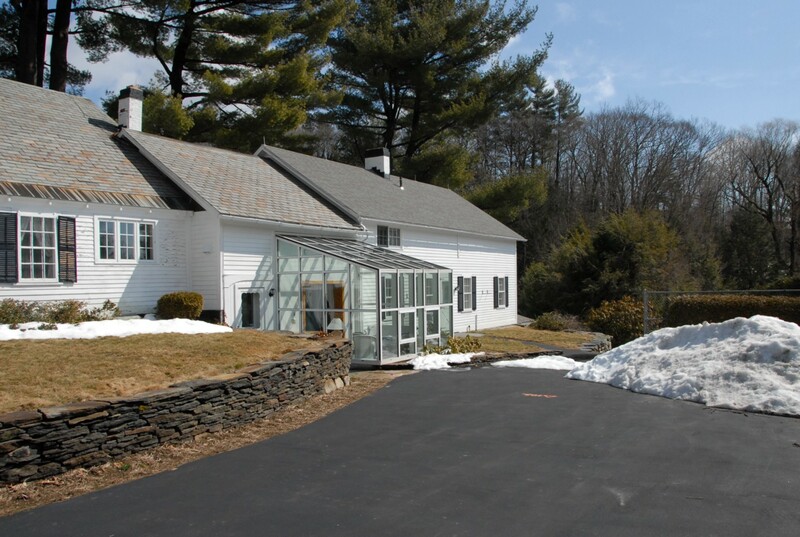 The front and middle sections have slate, but the back — the old barn — had a large, featureless, south-facing asphalt-shingled roof. As it turned out, solar companies told us that this south-facing roof could hold enough solar panels to cover our electricity usage and more. They also believed that it could work out financially, by which they meant that if we invested in a solar system, we could most likely get our investment back in 5–8 years. To read more of this story, including how we calculated ROI, on Medium or LinkedIn. 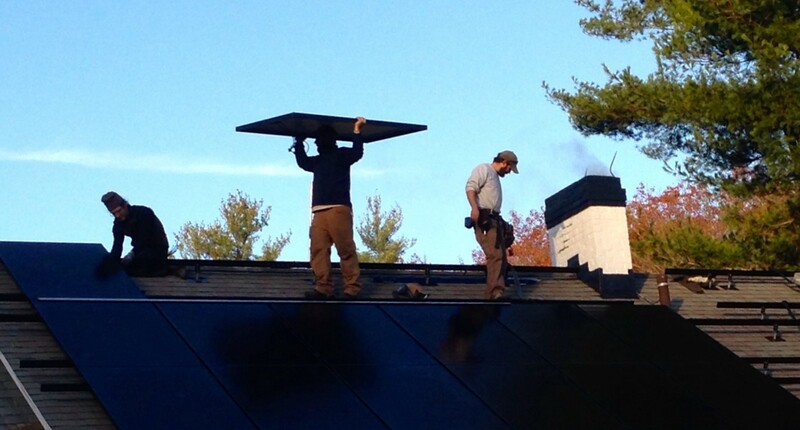 Massachusetts is leading the clean and green tech revolution in the United States. From Governor Patrick’s leadership to our top-tier universities and every startup in between, we have all of the necessary elements in place to help drive our progress. It’s important to note, however, that all of this innovation isn’t happening in downtown Boston. Many are quick to assume that the Bay State’s cleantech advancements are developed in the Innovation District or the Leather District but believe it or not, many of the latest and greatest technologies are born just across the river in Cambridge and Somerville. The latter of the two is stepping up its green tech game by launching an initiative to engage members of its community to help mold Somerville’s energy future. At Greentown Labs earlier the week — the pioneer of green and cleantech in Somerville — Mayor Joe Curtatone announced the City’s official Request for Information (RFI) in an effort to gain information that will help develop a program for the City to collaborate with emerging green tech companies that can be applied throughout Somerville. Cue the cleantech entrepreneur happy dance! Amiright?! Not only is Somerville hugely supportive of green tech innovations, it’s asking its brilliant community members for their ideas about how different technologies can be rolled out throughout the City. Hats off to Mayor Curtatone and his whole sustainability team. It’s not everyday you see city leadership asking its people for disruptive concepts to ignite positive change. Buried deep in Apple’s big announcement yesterday was a small checklist that ticked off their environmental credentials. I cannot overstate how unimportant this was to the full announcement, the fact that it was even on stage is surprising. You won’t find the checklist in any of the coverage, which focuses entirely on the features and benefits of the new Apple products. 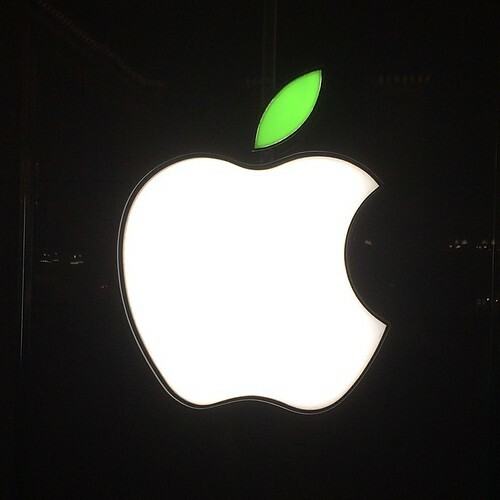 There is plenty written about the new Pay feature as well as the design of the Apple Watch, but want to know how green the product is? I found only one story on that and it’s mostly a critique of people critiquing Apple’s environmental credentials on Twitter. It’s a decent list, but look at how it’s presented. The important elements are in darker text so your eye finds them fast, the rest are really secondary. You know it’s environmental because it has that cool Apple logo that they roll out once a year. But I don’t put this here to bash Apple, they’re just reading the market and maybe satisfying that segment that wants to check the “green” box. They know that consumers have a passing interest the environment and the list is enough for them to say “OK, Apple’s got this” and then move on to the cool stuff like how big it is, how fast it is and when can you take my money! For companies in the cleantech and clean energy space, this means something much more. When branding a sustainability, clean energy or cleantech company, it’s important to keep the true buyer in mind. If you are marketing to a checkbox item, then you’re not core to the business thereby making your sales position weak. Worse, your value proposition won’t enable you to charge a fair price, or even a premium, for your products, since “nice to haves” are cheaper than those products that speak to core business needs. Tesla makes cars. Tesla makes technologically advanced cars. Sure, the team wants to disrupt the auto industry and even have an environmental bent by taking on the internal combustion engine. But at its heart it makes cars that are as good or better than anything that Mercedes puts out. That’s what sells, it’s what people want, it’s what Tesla makes. No one buys a Tesla just because it’s electric. You may feel like the competition is in the environmental industry, but it isn’t. Apple may be committed to putting a glass on its iPhone (and Apple Watch) that uses no arsenic, but first and foremost the glass must work for the phone. If it’s weak, cracks and scratches easily, or doesn’t have the right feel, then it wouldn’t be on the iPhone. The company may be running an entire factories and data centers by solar power, but if that power drives up the cost of doing business or can’t support the manufacturing infrastructure, then Apple will just put itself back on the grid. First and foremost, the plant needs power. How it gets that power is secondary. As a company, your real competition is the alternative method of doing business. Your solution needs to not only be sustainable and provide a positive environmental impact, but also do the job as well, if not better, than what it’s replacing. Sales folks are on the front line and constantly getting feedback from customers, they know what works, the competition and the true concerns of their prospects. Listen to them, go on calls with them, get their feedback on the messaging. They will know what motivates customers and therefore what should be built into your marketing messages. Just like in other industries, any advances are only as good as the benefit they bring. And for cleantech and sustainability companies, that benefit must go beyond the environmental impact. The PR world is abuzz with the Guardian headline from last week, proclaiming that the world’s top PR firms won’t represent climate deniers. “World’s Top PR Firms Rule Out Working with Climate Deniers” the UK-based publication declared. It’s a great headline, even if the story is not nearly as black and white. Yes, a number of PR firms said they wouldn’t represent groups that deny climate change, but others, like Edelman, were not so willing to toss aside clients based on ideology. Quite a few others didn’t even respond to the survey. The basic premise of the study, conducted by the Guardian and the Climate Information Centre, is that PR firms play a strong role in crafting the messages that are fogging the climate change discussion. “I think that public relations people are right at the elbow of powerful people in industry and government,” James Hoggan told The Guardian. He is a former PR firm owner who also founded DeSmogBlog, a site devoted to separating PR spin from fact when it comes to climate science. “You are an insider – a very trusted insider – and you can have a huge influence. It really does matter. These are influential organizations,” he continued. It is true that there are certain areas of black and white in the cleantech world. Yes, the world is undergoing a major change in climate, the science points to that. Yes, that change is happening quickly and is man-made. In the first half of , the three big areas were transportation, solar, and agriculture and food, according to the Cleantech Group’s definition. Energy efficiency also remains a consistent area. Peel back the covers and what’s in that agriculture column? It could be companies engineering plant life to grow with less water or companies using drones to better monitor crops. Also falling into the cleantech bucket is a company like Uber because it’s about reducing car trips, as well as solar energy installer Sungveity, which doesn’t develop its own technology but installs solar panels. Even for those concepts that seemingly fall firmly into the “green” category, not everything has a bright line. A recent article on Citylab (formerly Atlantic Cities) focuses on green parking. The premise of the article is that parking itself can be a “greener” process if developers look at the right factors. The counter to that, however, is that driving itself should be discouraged and that focusing on parking at all is the wrong way to go in order to be “green.” It’s an argument that has no true answer, both sides have their points. It would be great if fewer people drove in individual vehicles and instead chose less polluting forms of transit. But the reality is that driving is a big part of our transportation infrastructure and our culture. Shouldn’t we accept that and take pains to improve, even if it isn’t the ideal? In many cases the lines between cleantech and confusion are clear, but in many more cases it’s all clouded in a bit of smog. The best we all can do is listen to the facts and make our own informed decisions.